8 minutes across was produced in response to the exhibition theme: 'Voyage: sea journeys, island hopping and trans-oceanic concepts'. An 8 page concertina book with pages that decrease in size to denote the passing of time on the short Star Ferry journey between Kowloon and Hong Kong Island. Each page represents one minute of the voyage across Victoria Harbour and is a typographic exploration of the crossing, the ferryï¿½s environment and the surrounding landscape. Drilled wooden covers replicate the onboard seating. Following a successful proposal, this artefact was accepted for exhibition at: Künstlerhaus Dortmund, Germany as part of 'Voyage: sea journeys, island hopping and trans-oceanic concepts' curated by Imi Maufe (Norway) and Rona Rangsch (Germany). 9th Feb to 17th March 2013. This artefact has been purchased by Oxford Brookes University for their special collections Library. 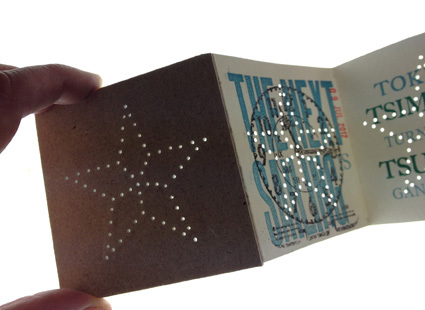 To be exhibited as part of ‘ARTISTS BOOK EVENT’ IMPACT 8 INTERNATIONAL PRINTMAKING CONFERENCE, 2013. The conference title/theme is ‘Borders & Crossings: the artist as explorer’ and will celebrate the practice, concept and application of print and printmaking in its widest possible constituency, Impact 8 will build upon the meeting’s reputation as a truly international event whilst reflecting the cultural identity of Scotland and Dundee’s reputation and heritage as the ‘City of Discovery’ Scotland from August 28th – September 1 2013. Curated by David Faithfull in Dundee.